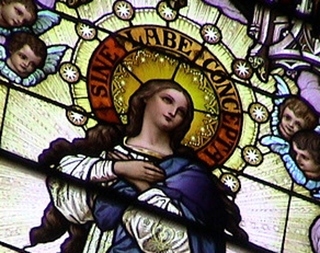 Here’s Day 1 of the Immaculate Conception Novena! Blessed Mother, take my prayer to your Son that my son chooses the job that is best for his family and his heart is open to your Son’s voice. May the decision come quickly to relieve his stress and his wife be supportive. Please God, and mother of God, give George a healthy body, mind, spirit and soul. Help his family to be happy and at peace. Thank you for every blessing we have already received. Please make me well body and mind in order that l can help others, Thank you for a friend like Audrey and that l can help Keith and Gineen. In the name of the father. Amen. Praying for a dear friend that has just passed with cancer. As always. .restoration of mind body and spirit. .and family unity and forgiveness and most of all love! Mental physical and spiritual and financial restoration. ..and as always strength and courage to always fight the good fight. ..
And ..PEACE to all, especially those who know no better! !!!! I pray for President Trump. Please help him save our Country and freedom and help him defeat our enemies. Bring peace to the World. I pray for the Pope and all clergy. Bring those who have strayed from the truth and who have made compromises back into complete Union with you. Grant courage not to compromise with the World. Keep your faith, handed down by You, intact and true. Help the souls in Purgatory and grant them speedy deliverance into Your Kingdom. Help me to be able to really pray once again. Lift this painful dryness from me. Physically, please give some strength back to my spine so that I can do my duties without the incapacitating pain. Never let me stray from your path and give me courage to give up my life, if called upon, rather than deny You. I am praying for a job, so that we can be able to pay our bills and be financially stable. Also, praying for my step-daughter who is about to give birth, for their health and for Faith to come into her life. Merciful Mary, please watch over my children, myself, my family, protect our hearts, mind, bodies and soul. Shield us from all evil, free us from harm and keep us under blanketed under your cover. Thank you, Mother Mary. Immaculate Mary, I pray that you be with my mother Barbara at this time in her life while she deals with Demencia and I pray for peace for her that she can find her way to heaven to be with her mother who she asks for every day. She no longer remembers me as her daughter. Though I have her in my home and am her caregiver it has become truly taxing on my own health. I’m ok that she leaves this earth. I also pray for others suffering from demencia. In Jesus name I pray. I pray to overcome these pains that I get whenever I am going on a trip especially flying. Help me to over come this anxiety that brings on sickness. I pray that my husband takes better care of his health. I pray for all the innocent victims of sexual abuse. I pray for Dana to be better soon. I pray for my dear friends those who are ill to feel better and blessed. Please pray for my family to understand and respect one another. I pray that my son will come home for Christmas with a change of heart and the tenderness that he once had for his family. For my son in-law to find a temporary job while he is looking for work. Please pray for me that I can talk with my daughter truthfully and openly regarding her marriage. For my daughters to be more aware of how much they are drinking. For my marriage that it will deepen during these times of trial. For world peace. I pray for love in my family. I pray for my marriage, for healing and restoration. I pray for the salvation of my husband and for revelation if where we fall short. I pray that the prayers of our twin boys -daddy joins us in night time prayers, daddy joins us in church, daddy takes us on adventures, and that we celebrate Christmas together with mommy and daddy and all family here- be answered. I pray for a supernatural miracle that resurrects our marriage, our love for one another, and our family. I pray that I will always be able to reach out to those who are in need. I pray that my daughters , husband, family and myself will not have poverty in our lives. In Jesus’s name I pray Amen. Immaculate Heart of Mary I pray for my family to have a safe and loving Christmas. I continue to pray for our finances and good health for my family and friends. I continue to pray for my children and their sufficient others to grow in love and faith. In the name of Jesus, I pray Amen!! Lord I pray for financial deliverance. I pray for money to pay my son’s tuition fees. I pray for my family.blessed mother please intercede for me. Mother Mary you are a mother I ask you to heal my daughter Amber ??? ?.Take away all her unhealthy thoughts of wanting to die. Fill her once again with love ????. I pray by the mighty power of your holy Rosary I claim spiritual warfare over her cleanse her and make her whole again. Amen ???? I pray for your guidance and help that I may learn to emulate you as the perfect example of living Gods will. Help me, teach me to love and serve as you have always done. Pray for my body, that I will have the strength to continue always in His ways and to show His will, as you were able, all my days. Pray for my mind, that will not go astray in my thoughts. For if my thoughts remain pure, His glory will shine. Pray for my soul, that I may be a saint with you in Heaven. I know that my desires are difficult. For you, Blessed Mother, are awesome truth, purity, glory and holy servitude to our Lord and God. And that it is my greatest desire to achieve. Holy Mary, Mother of God, born without sin, help me. I am a sinner and I want to be a saint. Help me. Please pray for me as a take my finals tomorrow and Friday. Also for my brother who will be taking a big test to end his program, and for my health. Thank you, and God bless! Lord jesus, blessed mother, please intercede for me. I pray for a financial breakthrough. .I pray for money to fininace my son throughout medical school. His tuition fees are due . I pray for my marriage and my family. For my family. For my son he will come back to the faith and get a job. For his healing body mind and soul. Thank you. Please pray for my family to love one another, look out each other and respect each other. And i pray that God heal me, and also help us find solutions to our problems after the effect of house fire, it’s been 2 months now since the house fire, and we didn’t have any help, also the families that lost their homes, and their personal belongings. Please, pray that they could find help. Please pray that my husband will pass a special exam he’s taking right now. Amen. Prayer for peace,joy, good health and victory for my family on our journey with Christ. I come to you as your daughter praying for healing in body, mind and spirit. You know all my problems. Please pray for peace of mind about all these challenges. For all those I promised to pray for, esp my children and grandchildren. For the souls in purgatory. Walk with me as I find God’s purpose in my life. I renounce any attachment to negative thoughts and habits. Pray for my strength dear Mother and for patience as I await His healing touch. Provide the resources that I am seeking, esp friends for the journey. And peace of mind about the future. Heal the negative areas of my life and my soul. Bless me with joy and peace, and the special needs I have in my prayers. Pray for an outpouring of the fruits and gifts of the Holy Spirit. Bless me with the Father’s love and the support of our Lord Jesus. I surrender to you Holy Trinity. Blessed Mother, I devote myself to you. In Jesus’ name, Amen. Health and sound mind for my family. I and members of our family and friends are praying this novena for my husband, Jesse. He has Stage 4 colon cancer and the chemo is no longer working. We are making a pilgrimage to Lourdes, France in 2 weeks and our prayer intention is for his good health and safe travel during this time, and to receive all the graces, blessings, and healing the Lord deigns to grant him through the Blessed Mother’s intercession. O Mary, conceived without sin, pray for us who have recourse to you. Please Lord help me to find peace either at work or at a new job where I am appreciate and not taken for granted. I asked for a financial blessing that only YOU can provide in my time of need Father. I humble myself before YOUR throne and trust that YOU not only hear me but will bless me YOUR faithful and obedient daughter. Thanks be to God forever and ever. Amen. We’re praying for peace and health to do gods will. Thank you for these beautiful Novenas. I am asking prayers for my dad’s eye & overall health. That he find peace and relief in this advent season. I am also praying for my husbands health. That he be lifted up and free of knee & back pain. I also ask for prayers for my two sons W & J that they are guided by the holy spirit to be free of anxiety on their upcoming finals and use all the knowledge God has given them to be successful. Prayers for myself on success of lowering my blood sugar. That our president elect Donald J. Trump picks all the right people to fill and run his cabinet positions, and for peace in our country!! In you, oh Lord, I put ALL my trust, in every area of my life. You commenced this year for us with your mighty deed, may we end and commence the new year with your mightier deeds, in every area of our lives in my family. Grant us all, forgiveness of our sins and the grace to love and serve you more. These and more I ask, through Christ my Lord. Amen!!! I pray for my children at this time. As a family, we have been enduring a valley of darkness without an end in sight. My son is unhappy in school and in his sports circles. Lord, grant him the growth he so desires in every sense of the word — so he can better serve you as a model of muscular Christianity for today’s youth. Please let your favor shower down upon my daughter so that she can have the choices of her dreams for college and dance opportunities. And guide her to the perfect place for her. Heal her of all of her physical and mental ailments … once and for all. I cast out the spirit of depression and self-pity from our lives in the mighty name of Jesus. Let both of my kids love you Lord and keep their hearts always seeking you… closely tethered to you. I praise you Jesus for the comfort of this novena community and for your daily dose of merch upon me. Thank you, Jesus. Lord i am praying for Karabo and Lisani. Please deliver them from drugs and alcohol. from evil spirits. I am praying for my family to love and have peace with each other, heal my sister in Jesus name. Please pray for me and my blockmates to graduate college on time next year, 2017. God bless! Our Lady Immaculate Conception please pray for me as I go through challenging time in my life and have been unfairly accused prosecuted. Pray for my grandmother for her health. 1) pray my husband for his applying full time position on his job at A. Nursing home. Always guide my husband on his work as partimer at Retirement home and more blessing. 2) Pray my case for victory regarding my medical condition as well my husband case for the victory of their unions. 3) Pray my families love, respect, peace, happiness, protect from danger and always in good health. 4) Pray my son to heal on his shopping addiction and guide him always on his wrong doing. Pray him to love and respect us parents. Heal him by being hot tempered. Guide him on his schooling and work. Heal him on his depression and stress. 5) Always guide my daughter on her work. Blessed her to become financially supportive and loving parents. 6) Pray us for financially struggles. We are behind on our utilities, debts and mortgage . Thank you. Please help me to sell my house. Health happiness and safety for my family and friends as they travel to and from school and work each day. Peace and happiness this Christmas season. Mother Mary please bless me with Good health long life and another healthy child. I pray that my husband find inner peace and comfort. Help him to find ways not to take out his frustrations by being abusive . Help him to recover all his financial losses . I also pray for my son tez to be cleared of all the allegations against him. Pls lead his steps to a bright and happy future. Help him find love and peace in his life. Please HS enter the heart and soul of my daughters and grandchildren. Bring peace love and joy into all the family. Help heal the physical and financial and spiritual needs of each person so that they will feel your care. Let all the family be wide open to hearing God ‘s still small voice. Remove all cultural noise. The Advent Retreat is different from this novena, there is a site where you can sign up for it, go to: http://www.praymoreretreat.com It consists of presentations from 4 well-known speakers and study guides. If you haven’t received any materials, it is because you have not signed up in the proper place for it. Hope that helps! Most Blessed Mother, I pray that you help me grow in faith and express my faith through example. Please help my friend Keith to find employment, please help my friend Kathy to maintain remission from cancer and please help my husband, Kevin to remain employed so meeting our daily needs doesn’t have to be such a struggle. Thank you for all my blessings that you have given me (family, friends, career). May I always remain grateful for all that I have. Friends that are traveling on the road. Tiny twins coming early Mother Mary. Please smile over them as you did my baby Savior. I ask also for physical healing for grandparent of twins. Thank you Holy Queen. Sale of brothers house and good price. Happiness for family and friends. Good health for Ben and Chuck, also successful kidney transplant. It has been a very challenging and difficult military change of duty station move for my family. May we find settlement and stability both in health, education of the children, and financial status. We offer our hardships and suffering, we seek mercy for our sins and imperfections; and we implore your help and prayers. Thank you! For loved ones to be cured if Alcohol use disease. I am asking for prayers for my son to have the wisdom to make the right decision about a relationship and to have the strength to do the right thing ! May he also stay focused for his finals ! This website is one of my most favorites. The kindness and trust of Our Blessed Mother Mary and the Infant Jesus and your compassion for others is touching. I have always found Novenas difficult to remember to do? This makes it a true joy! Love the podcast! Lord jesus, blessed mother I place my son into your hands. I pray that he would be successful in his exams. I pray for money to finance my son through medical school. His fees due soon. Please help me by providing the avenue for money to flow through my account. I pray for my sister who is unemployed. I pray for my daughter who have her end of term exams. I am thankful for this website. This pray more novena have changed my life. I used to watch shameful movies and I tries hard to stop but I failed, however when I joined this website and prayed several novena my life changed. I feel a shame even to think of that I used to do. For this novena, I would like to pray for may marriage. We have been living for 6 years all this years I stopped receiving the holy communion. it is hard for me. I have been asking my partner to take our relationship for blessing but he gets angry sometimes he doesn’t respond at all. painful subject is he refuses to go to church at all. I also pray for the situation at my workplace. the school principal and the ordinary teachers were not in good terms, I fail to understand what is happening at our school. sometimes I feel like quitting the job, but how will I survive. Apart from this, I have having time conceiving. praise God I am bless with a girl. since I get hard time to conceive when it happen the pregnancy last only for three to four months and I get miscarriage. There are many disappointment in my life. several years I have been applying for promotion but my application is always unsuccessful even though I meet al the requirements. Lastly, I pray for my mother who is suffering from knee problem, that she maybe strong and that she may not lost hope in God. My young brother is addicted with drugs I now and believe that our blessed mother will do great miracle for me. I wish all the people praying this novena a successful moment. Nothing is too hard for God. May the Lord continue to bless you and give you the grace to stand in faith and trust Him in all your ways. You are blessed! My pray request is that Donald become my husband and please help my son. Pray for me and pray for my finance. I ask for pray for the Guillory family. I request that you pray for me to increase my faith in Jesus our risen lord. Please pray for me to stop drinking alcohol and smoking and attain good physical health . Please pray for me and the thousands like me who have lost their jobs so that we may have employment / income to take care of our family needs. Right here in Trinidad there are thousands like me who have had our good jobs pulled from under our feet because of the down turn in the oil industry . Please pray for all those who are at risk of loosing their homes because they cannot meet their bank commitments. Please pray for all to get a employment / income to meet family needs. Please pray for all affected to not fall into despair / frustration / depression. Please pray for all to have the strength knowing that Jesus in working for us and we are not alone. There are thousands of us out here in Trinidad . Please pray for us. For this novena, I would like to pray for my marriage. We have been living for 6 years all this years I stopped receiving the holy communion. it is hard for me. I have been asking my partner to take our relationship for blessing but he gets angry sometimes he doesn’t respond at all. painful subject is he refuses to go to church at all. I also pray for the situation at my workplace. the school principal and the ordinary teachers were not in good terms, I fail to understand what is happening at our school. sometimes I feel like quitting the job, but how will I survive. Apart from this, I have having time conceiving. praise God I am bless with a girl. since I get hard time to conceive when it happen the pregnancy last only for three to four months and I get miscarriage. There are many disappointment in my life. several years I have been applying for promotion but my application is always unsuccessful even though I meet al the requirements. I am praying that I will have the ability, strength, willpower and devotion to complete my 2 week sugar detox, which will then lead me into seeking full healing of my eating disorder which I have suffered from without respite since 1983. My request, I ask that you pray for me to increase in faith in our risen Lord; I ask that you pray for me to increase in hope in our risen Lord; I ask that you pray for me to increase in love for the risen Jesus!